Do you have a feeling your cat has plotted to ruin your home? Well, you are definitely not alone who has this feeling. Cats, however, don't mean to ruin your house on purpose. They simply find ways to satisfy their natural scratching needs. If your house isn't cat-friendly and doesn't provide a sufficient amount of options to meet this need, you shouldn't be surprised that your cat makes its own decision about which objects it will scratch. The same applies to broken dishes, vases and other items. Cats don't break them deliberately, they explore their domain like any other animal would do. If you don't have enough cat trees, shelves, and high spots designed specifically for your cat, don't get mad at your companion who is merely trying to find the best observation spots and walking paths. Destructive cat behaviour can be really frustrating, but your cat doesn't do this to make you angry. It's just trying to be a cat and adapt to your home. If you try to look at things from a cat's point of view and understand its basic needs, you will be able to provide positive, non-destructive outlets for your cat's behaviour. Cats have an instinct to sharpen and wear down their claws. They also have an instinct to leave scent behind on objects to mark their territory. Scratching does both, and cats often return to the scratching objects to leave their scent again. If you don't want your cat to scratch your furniture, wallpapers or doorways, get one or several cat trees (scratching posts) and train your cat to use them. If your furry companion ignores the present, rub a little catnip onto the post. Most cats will start rubbing against it leaving their scent. Later on, your companion is likely to return to replenish the scent. 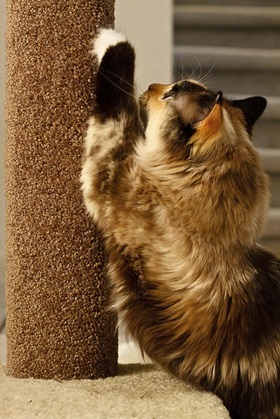 There is a great variety of cat trees and scratching posts available on the market. You can even do one yourself, if you like. If your cat keeps ignoring a vertical scratching post, consider getting a horizontally oriented one. Cats have their own preferences just like people, and what one cat likes another cat can refuse. Stay creative and inventive. Your cat will surely give you signs what scratching methods it prefers. To prevent your cat from further scratching on inappropriate objects, try a cat deterrent spray which can be purchased in most pet stores. Make sure your house is equipped with high spots and walking paths your cat can sit on and observe its domain. Cats feel much safer when they can get higher than the ground level. Imagine yourself being among giants all the time, and those giants can even step on you by accident! It feels a little intimidating and uncomfortable to say the least, doesn't it? Provide your cat with its own safe observation spots where no one can disturb it, neither you nor your kids, nor other pets (dogs in particular). When a cat knows where it can go for solitude, its temperament becomes much more balanced and pleasing. It has less desire to get onto tables and other furniture, breaking down your fragile accessories. Your cat won't necessarily stop doing it once and for all. Curiosity is part of its nature, after all! But the amount of accidents should reduce. Whenever you're not happy with your cat's behaviour, please remember your cat is most probably just trying to satisfy its natural needs! It doesn't plot to drive you mad.